The big-money-backed startup sees a big difference in its expertise in pushing energy storage into mainstream. 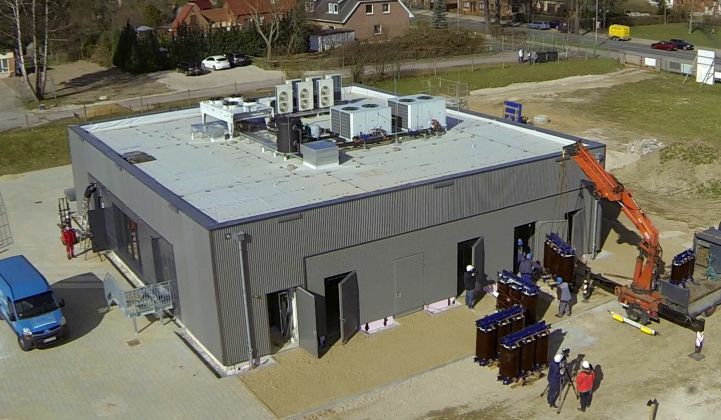 One of the benefits of spending €15 million and six years building your own multi-battery, grid-connected technology test site is getting the chance to learn how software can optimize the lifetime performance of megawatt-scale battery arrays -- not as they appear on their spec sheets, but as they really are. This is the kind of experience that German energy storage software startup Younicos has been gathering since 2009, when it opened its technology center outside Berlin. The lab contains a 1-megawatt, 6-megawatt-hour sodium-sulfur battery from NGK for long-term energy storage and a 200-kilowatt-hour lithium-ion battery from Samsung SDI for high-power applications, along with multiple inverter technologies to convert their power from direct to alternating current. Those systems are tied into 14 kilometers of medium-voltage grid circuits, along with the transformers and switches that can island them or interconnect them to the outside world, as well as a megawatt-scale diesel generator. Finally, it has Younicos’ software, which ties together batteries, inverters, generators and the ability to simulate the impacts of moment-to-moment fluctuations in wind and solar power, much like Germany’s grid faces every day. All told, it approaches what government-funded labs have to offer on the energy storage systems integration and performance testing front. This real-world experience could help separate Younicos from a host of other energy storage management software (ESMS) vendors, Stephen Prince, chief revenue officer, told me in an interview last week. "It’s not a difference in philosophy or vision. It’s a difference in perspective and experience,” he said. Younicos has parlayed its expertise into 16.2 megawatts' worth of battery projects in Europe, from hybrid battery systems on the Azores island of Graciosa and the Italian islands of Sicily and Sardinia, to grid-tied systems in Germany and the U.K. capable of performing up to 22 different functions, from sub-second frequency regulation to multi-hour renewable power shifting, he said. Last year, Younicos bought the assets of Xtreme Power, a bankrupt U.S. grid battery maker and control software vendor, adding about 60 megawatts of working projects to its portfolio. That puts the company in second place in terms of U.S. battery projects deployed, behind AES Energy Storage, the business unit of U.S. energy giant AES, and ahead of contenders such as Greensmith, NEC/A123, and Tesla’s soon-to-be-announced energy storage business. Younicos has another 120 megawatts of projects in final negotiation right now, and expects its 2015 backlog to add up to triple the 21.5 megawatts it installed last year, Prince said. But counting projects in the ground and under development isn’t the most important metric for future energy storage success, he added. Thermal anomalies can reduce or increase battery life by 60 percent, he said. And while on-board battery management system (BMS) software is meant to detect these problems, the overarching control system might not be incorporating that feedback into its ongoing system operations. "We validate those chemistries, those racks, those BMSs, because we’ve had those moments where something doesn’t run as specified in the technology center,” he said. That’s given partner-investors like Samsung the confidence to extend 20-year warranties for its batteries when controlled by Younicos, compared to the far more typical 10-year warranties that come with most grid-scale battery systems, he said. Most of the world’s grid-scale battery systems have been installed in the past half-decade or so, and haven’t been running long enough to prove whether they’re going to pay themselves off over their projected lifespan. Knowing the difference between expectations and reality could well spell the difference between a money-making project and one that can’t meet its targets. The earliest grid battery projects were largely supported by government grants and engineered as one-off projects, allowing for some leeway on these harsh commercial realities. In that world, the software expertise that Younicos says it can provide “isn’t as big a differentiator,” he said. In fact, “it’s a bit of a disadvantage to us,” because Younicos’ software expertise and 24/7 operations center oversight does come with extra costs. "Ultimately, though, these anomalies are going to play out, he said. “Those that can do it right and successfully and effectively are going to be able to price their software on the market.” Those that can’t may find their software running up against unforeseen problems that undermine the capabilities they’re claiming, he said. This kind of expertise could also help Younicos grab a bigger share of what Prince called the “blue-ocean” opportunities in energy storage, he said. These are projects that aren’t put out for public bid by utilities and government agencies, where vendors have to fight to underbid one another on cost, but instead are being put together under the radar by big industrial and corporate customers. Prince predicted that the next two to three years will see these differentiating characteristics start to become apparent in the energy storage marketplace. GTM Research projects that the U.S. market will boom in the next four years, growing from $128 million to $1.5 billion. European and Asian markets could also grow rapidly, driven by the need to bring solar and wind energy and power grids into balance. Bringing real-world battery performance into balance with whatever excessive expectations may exist for them will be a critical step toward making this growth possible.